Athabasca homepage. Note the prosimity to Ft. Mac. Enbridge, an Alberta pipeline company, has made an agreement with Athabasca Oil Corp (AOC) to transport crude from AOC's Hangingstone project. They say this will cost Enbridge $200 million, apparently for running a 50 kilometre line from Hangingstone to its Cheecham terminal and expanding the facility there as required. They say Enbridge already connects 8 oilsands projects to terminals. There is a bit of a mismatch between this article and AOC's Hangingstone page. 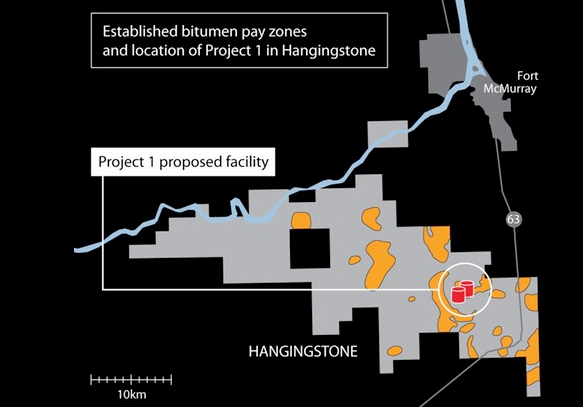 The article says the first phase of Hangingstone is supposed to start production at 16,000 barrels per day, but the company page says it only has approval for a 12,000 barrel per day development. It's possible the difference is made up with diluent of some kind since I don't think they're upgrading the bitumen on site, but that seems like quite a big difference. Maybe they think they'll be able to increase the provincial approval amount if necessary. The pipeline is expected to be running by the second half of 2015, while Hangingstone Phase 1 is forecast to start production in Q4 of 2014. No indication of how Hangingstone will transport its oil in that 6 month gap, perhaps trucks (note that site didn't work when I tried, here's the cached version)? Or perhaps the Q4 2014 date is just for public consumption and the company is internally estimating 2015? The article also says a second phase is to follow at 60,000 per day, but the company page says there are two more phases at 35,000 each. These are forecast to start in 2017 and 2018 but aren't applied for yet so who really knows? I think Hangingstone is a pretty good property. Its main geological problem appears to be its relatively shallow depth, which means the steam chambers have to operate at lower pressures than other SAGD operations use. I assume AOC have ideas on how to get around that, however. Hangingstone is completely owned by AOC. Having a development owned by one relatively small company is unusual in the oilsands - usually these projects are either undertaken by a giant like Suncor or a JVs with a giant, like Cenovus and Conoco. Indeed, AOC has apparently been looking for a partner in Hangingstone and Birch. Because they're going ahead with this despite not having a sugar mama, I think Hangingstone is a very big deal for the company - it could make or break them, so presumably they're pretty confident it's going to work. AOC reportedly spent $478 million on oil sands projects in 2012, a number that's likely to balloon as things get moving in Hangingstone and elsewhere. The public may not be as confident - the company's stock has been trading at its lowest point ever over the last month, although a lot of that seems to be to do with problems with its light oil projects - specifically pipeline capacity problems. But that's a story for another day.